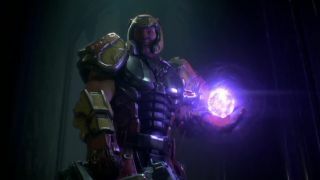 Bethesda was quick with the hits during its second-ever E3 press conference, instantly announcing the return of old-school arena shooter Quake in the form of Quake Champions. The Quake series makes for Bethesda's third modern resurrection of developer id Software's long-standing shooter franchises, following 2014's Wolfenstein: The New Order and last month's ever-so-metal DOOM revival. In true Quake fashion, Champions will feature fast-paced combat with multiple characters of varying abilities and play styles to suit each player's pace as they run headlong into battle. For now, Quake Champions has been announced as a PC-only title. The game will also be optimized to run at a display of 120Hz a second with an uncapped framerate, meaning that "fast-paced" becomes "greased lightning" in the hands of a decent computer rig - a testament to id's devotion to pushing hardware through its games. More about Quake Champions will be unveiled at this year's QuakeCon - a move that makes sense, if only because the franchise is the literal namesake of id Software's personal game convention. With a new Quake joining recent installments of Wolfenstein, DOOM, and the upcoming Unreal Tournament reboot, we think a renaissance of twitchy, old-school shooters is afoot. Maybe we'll see Bungie take a break from Destiny to put out a new Marathon game, or Gearbox try to bring Duke Nukem back to his roots so it can wash away the taste Duke Nukem Forever left in our mouths back in 2011. Our E3 2016 coverage continues!